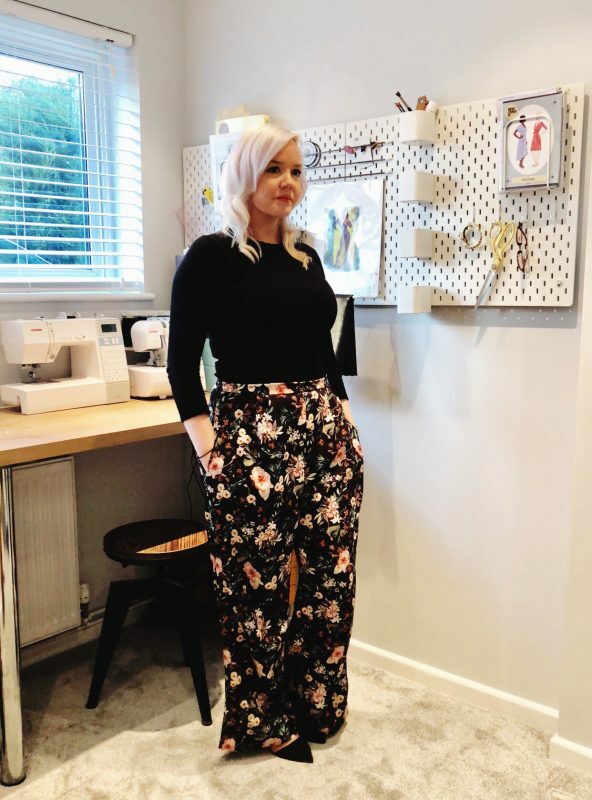 It’s been a whole 8 months since I last sewed something, and even longer since a make as part of the Sewisfaction Blogger team! Even though it felt like I was never away, as the team are so lovely and have still been keeping in touch and chatting all things sewing with me. Life has been busy, works been manic, I’ve gained weight, the house renovation still isn’t finished, we got a puppy that needed training and liked waking me through the night, we had a friend stay for 6 months!… but you know what? It’s been a good year, I love my job (it’s been a long time since I said that), I can lose the weight (plus eating is fun), we have a roof over our heads, we helped out a friend in need and we have a puppy!!!! Not sure if it’s just me but when you were a kid did you ask your mum and dad if you could open their post? Why was it so exciting as a kid to open envelopes, no matter what was inside. This is one of those things that as an adult its the opposite, you finally get lots of letters with your name on but you don’t want to open any (adulting can be boring!) … unless of course the envelope is pink, shiny and has been packaged up by a lovely little shop in Wokingham! Last week one of those landed on my desk at work, containing the most beautiful fabric from Sewisfaction. For my latest project, and my dive back into sewing, I wanted to make sure that I made myself an item of clothing that fits in with my style and wardrobe. 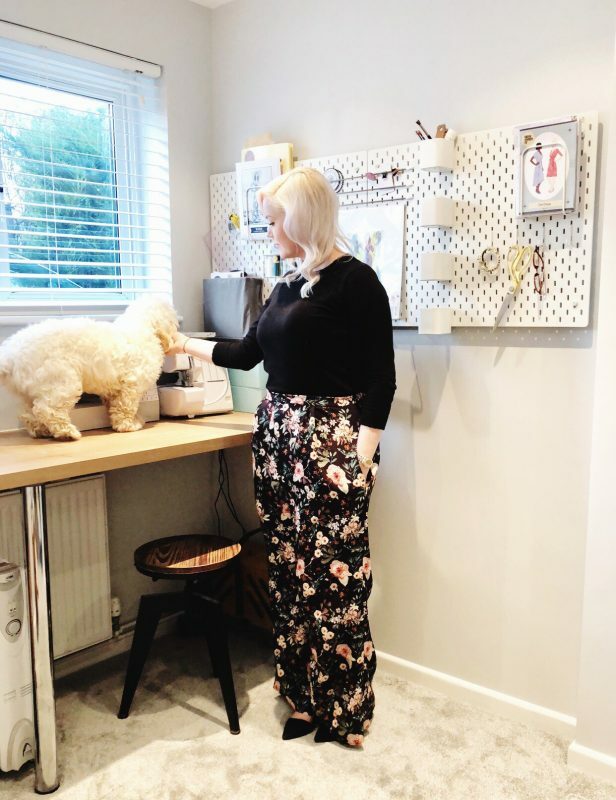 With so many gorgeous Indie sewing patterns being released it is very easy to want to sew them all without considering your personal style and shape (I’ll tell you another day about my Mila Dungarees!) So for this project I really thought about items in my wardrobe and I noticed that I love a patterned pair of trousers – all sorts of cuts and styles but all patterned trousers. 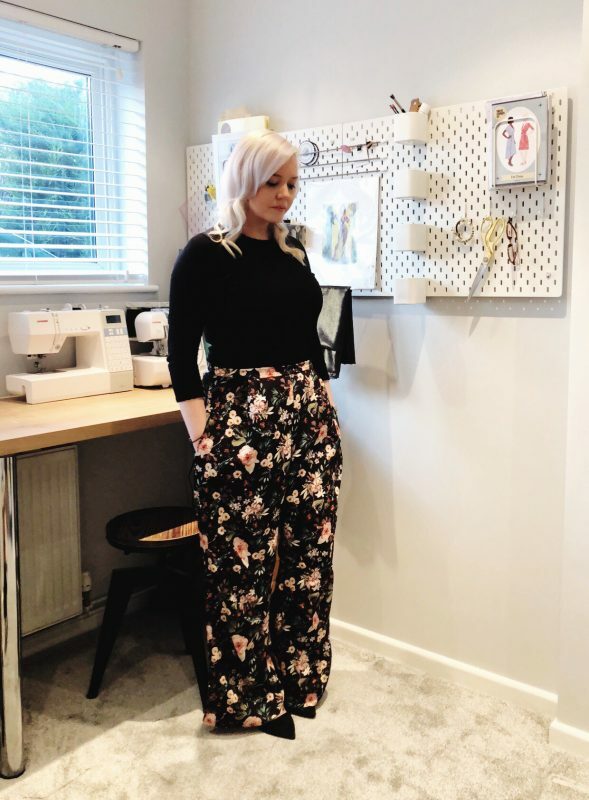 I already had the Nina Lee Portobello trouser pattern in my collection, that I was yet to make, so thought this would be the perfect project! The harder decision was the fabric, as I’m sure I don’t need to tell you about all the beautiful fabric available at Sewisfaction! So to narrow it down I knew I wanted to make the trousers in a Crepe, and being winter I thought a triple crepe would be perfect. 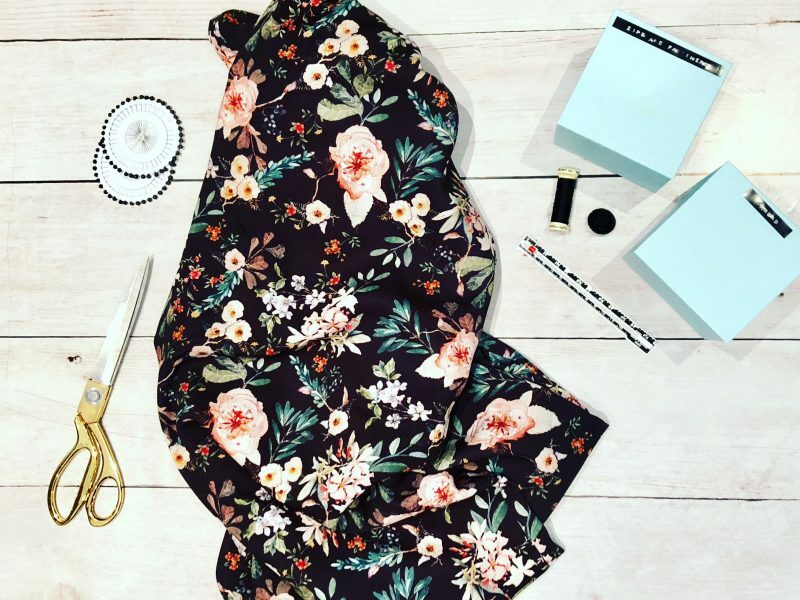 Who wouldn’t drool over this gorgeous Midnight Botanical Crepe?! When the fabric arrived I could think of so many other projects it would suit too, especially dresses. The Portobello’s are a high waist, 40’s style, with front pleats, darts at the back, back fastening trouser. Nina Lee’s Instructions are always brilliant and they are a cinch to make, so long as you can insert an invisible zip and don’t mind a bit of hand sewing. I love the high waisted style, what I haven’t been used to is a wide leg trouser. However, after finishing these I definitely need more in this style. My foray back into sewing wasn’t so breezy, my sewing day kicked off with me spending an hour rethreading my overlocker and then searching for a missing machine pedal. Now, you’d think everything would be where you left it but I gave my up my sewing room to become a spare room (for the aforementioned guest) and my husband agreed to share his office with me to set up a new sewing space. I thought I was going to walk back into sewing after my break and it all to be the same as before but I definitely felt a little rusty and made mistakes throughout my make! Silly things like sewing the front pleats the wrong way and having to unpick the whole waistband and messing up the buttonhole! It’s so easy to watch makers on instagram and everything look perfect, but I think it’s important to be honest and reflect reality – sometimes you balls up and hey hands up, that was me this week! My husband got the brunt of it and I had a bit of a whinge about being “rubbish at sewing now”, he very sensibly reminded me that you need to practice and that I can sew, I was just being tough on myself. 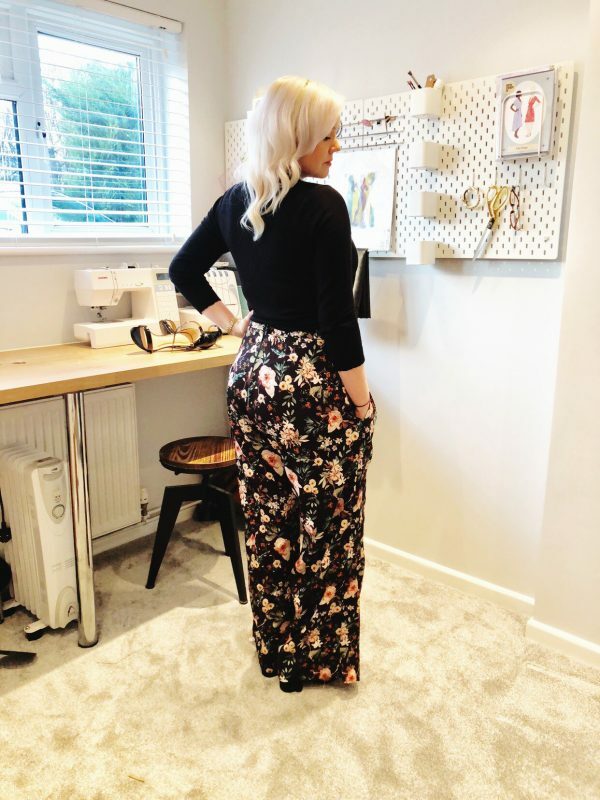 Im glad I persevered as I remembered how much I enjoyed the process of sewing, how it takes me off into a different little bubble and is really quite therapeutic… also having a new item of clothing at the end of it! I now have a glam but most importantly comfy pair of trousers, thinking of teaming them up with a black sequin top. It’s great to be back and I can’t wait to share more projects with you.